The Owner(s): Sammy Lazoja, Joseph Tranchin, Joe Covello, Todd Baslin and Fuji Lazoja. In this episode of the profit, Marcus Lemonis visits Standard Burger. 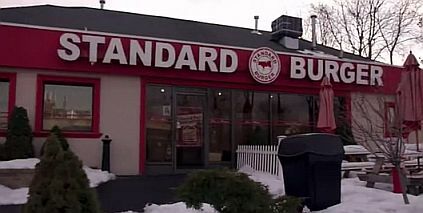 Standard Burger is renowned for its customizable burger experience, tasty potatoes and delicious ice cream/shakes. This is located in Hylan Blvd, Staten Island, New York. It was Sammy’s initiative to keep contacting Marcus for 2 years. He recognizes that their company needs real help to salvage their relationships and their business as well. Standard Burger is in a dire situation, but he knows there is potential for things to improve. There is no one who oversees the entire company full-time. The place is chaotic and messy. Lots of personalities and everyone is always arguing. All the other owners have issues with Sammy’s brother Fuji. Low sales and lots of debt. They fully depended on burgers for profit with a low profit margin. They have to improve their menu. Marcus strongly believes that there is hope for the Standard Burger and it can develop into a high-profit business. However, he pointed out how the worsening relationship among the owners complicates the situation. He wants to recognize Fuji’s contributions to the company with him having decades of experience in the restaurant business. He offered the owners $130,000 to pay for the existing debt, renovations and re-branding of the business. Except for Sammy, Joe, Joseph and Todd had to have reservations with the offer because Marcus wants to bring Fuji back. But Marcus defended his idea and they all come to and agreed with him. Marcus also asked them all to invest $15,000 to re-affirm their commitment. Fuji will be managing the Standard Burger, while Joseph will be the general manager. Marcus will own 30% of the business and takes 100% control for as long as its needed. The deal was sealed. Clean the entire business premises and renovate it. Make a new and improved menu. Organize all the stuff and apply new working process. Use the best raw ingredients and introduce new products with high margins. To start the whole transformation process, Marcus insisted that they have to temporarily close down the business for renovations. While the cleaning, organizing and renovation are taking place, they work on their new menu and think of new food ideas to add. Marcus took the Standard Burger owners to Amy’s Bread to see the freshest bread they could use as buns. They also visited Lucy’s Whey to find the perfect cheese. Everyone was amazed by the loads of different types of beef they saw at Pat Lafierda. To mend all the heartbreaks and frustrations of the past, they all went to Umami Burger. This was their time to chill out, talk and see how an established burger business operates. They could see the menu, the pricing and how the customers are being served. After picking the best raw ingredients, making new food items for the menu and transforming the place, the business finally re-opened. They are now introducing their Burger, Potato Bar and Shake Bar. Their business place is bigger, more organized, have new equipment, more tables and seats. Their $1,500 daily revenue increased to $4,500 a day. Marcus is happy, the co-owners are happy and the customers are satisfied. We wish the best for these friends and their business. After the remodel the place kind of looks/reminds me of shake shack. It might be a little more upscale.